Crocus vernus growing corm of the genus Crocus, also known as Spring crocus, Crocus vernus is perennial deciduous plant used as ornamental plant, grows in temperate climate and growing in hardiness zone 3-9. Leaves shaped like coniferous leaves. Flower color purple with yellow-orange stigmas, there are six petals and 3 stigmas. 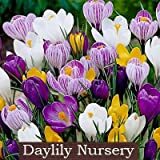 25 CROCUS VERNUS JEANNE D'ARC, 9/+ cm Bulbs, Priority shipping upgrade free! How to make Vegetative Reproduction in Crocus vernus? 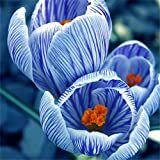 What is the treatment for vegetative reproduction in Crocus vernus?